Come with friends, or come by yourself. on the third Thursday of every month. 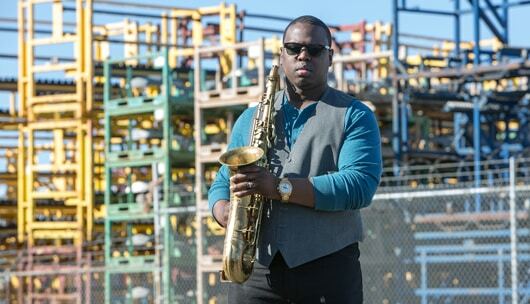 De’Sean Jones, from the internationally-renowned dance-music project, D3, leads this quartet that combines jazz with west-african rhythms and EDM to create the optimum soundscape for a weather-perfect August evening. With leader De’Sean Jones on tenor sax, MIkele Montoli on bass, Ashton Thomas on drums and Foluso Mimy on percussion. Shaki comes to us from New Haven, spinning rare and exhilarating vinyl from around the world. Every month, you can catch Shaki on-air at the long running community radio station WPKN 89.5FM, broadcasting from Bridgeport, Connecticut, and reaching the far corners of this world. – Bicyclists – Ride to Creative Cocktail Hour and get in for $5. RAW members on bikes get in free.